Garlic, Allium sativum, is an important crop for many market growers in the southern Appalachians. For direct marketers, garlic can be an important sales item to complement other early summer crop offerings. Though it requires advance site preparation and planning, garlic is generally an easy crop to grow, and one which lends itself well to organic production. Like many monocot flower bulbs, garlic is a perennial bulb and performs best when fall-planted. It begins to root shortly after planting, makes top growth the following spring, and eventually begins to senesce. Garlic is harvested by early to mid-summer. Garlic can be spring planted, but a chilling requirement must be met for the cloves to properly grow, and plants need to reach an adequate size before day length increases, which triggers bulb formation. To meet this requirement, spring planted garlic should be stored under refrigeration for at least 8 weeks prior to planting, and should be set as early in the spring as possible. Even then, in Western North Carolina, spring-planted garlic rarely produces a high quality harvest for anything besides green garlic harvests. Fall-planted garlic however, will obtain its chilling in the soil and has the advantage of gaining fall root growth and earlier maturity. If properly planted, cold temperatures per se will not damage most garlic varieties, but frost heaving of soils can affect newly formed roots. In particularly cold climates, mulches such as leaf litter or straw can help to prevent the possibility of frost-heave, while also controlling fall, spring, and summer annual weeds. Timing of garlic planting is important. In northwestern North Carolina (USDA Zone 6), late-October to mid-December plantings have been shown to be the best target period. This timing allows for good root growth and some advance top growth. Earlier dates may lead to too much tender top growth by winter; a later date may not allow adequate root development. For the Eastern Piedmont and southern regions of the state, best planting dates should be adjusted back accordingly, but still allow for adequate growing time prior to day-length cues for late spring bulb formation, and to provide for the 8 weeks of cold soil exposure for bulb chilling. November into early January may be good a good range for these areas, but growers will need to experiment to determine what works in their specific location. Soil requirements for garlic include moderate to high organic matter levels and most of all, good drainage. A waterlogged soil will cause cloves to rot. Prior to planting, soil fertility should be amended to add 30-60 lbs of nitrogen/acre, with phosphorus and potassium levels amended (depending on soil tests) at a 1:2:3 total nutrient ratio to added nitrogen. Composted organic matter should be added when possible. Incorporate amendments well into the soil. 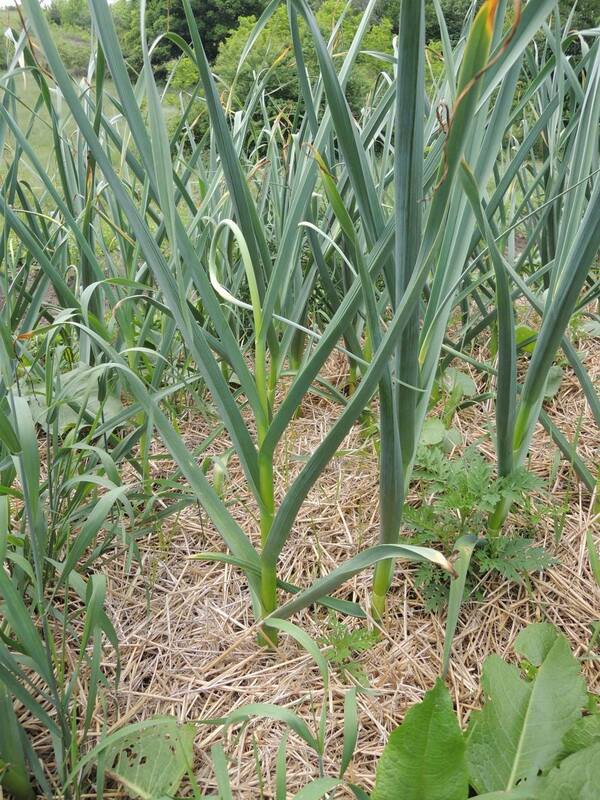 Most small-scale garlic growers utilize raised beds, especially if soils are heavy or poorly drained. 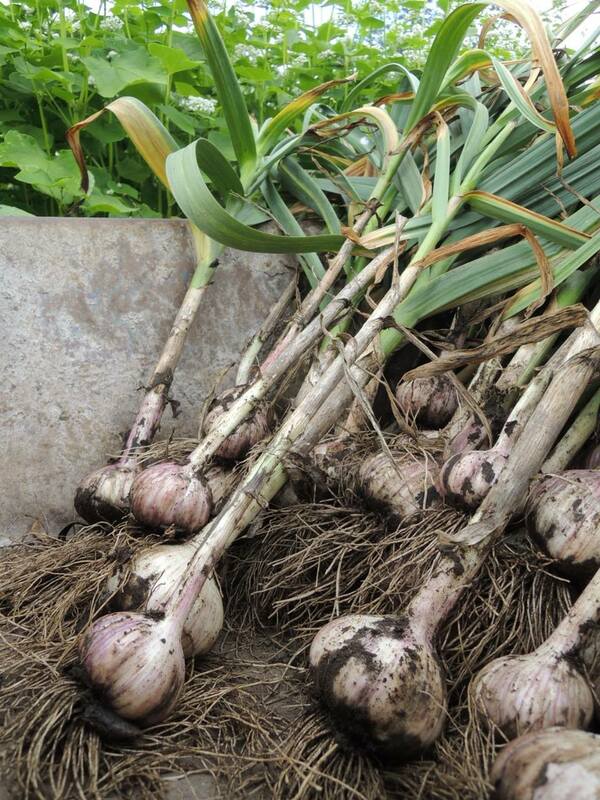 Misshapen bulbs may result when garlic is grown in heavy, clay soils. The optimum soil pH for garlic is between 6 and 7. Before planting, soils should be well tilled to provide a loose growing bed for bulb development. Because garlic plants do not produce true seeds, garlic is grown from cloves, a form of vegetative propagation. When planting, separate individual cloves from the main bulb and plant them about 4"-8" apart in the row. Plant cloves as soon as possible after breaking up and sorting your bulbs. Immediately before planting, check each clove for signs of disease. Discard any infected cloves or bruised cloves because they will decay in the soil (or eat them – a bruised clove will not hurt you!). As a general rule, the larger the clove, the larger the bulb will be at harvest; thus only medium to large size cloves should be planted, with the smaller cloves reserved for use in the kitchen soon after. On a raised bed, several rows can be planted, with each row 10-18" apart. Cloves should be set with the tip pointed upward, and 2-3" below the soil surface. Because garlic is a poor competitor, good weed control is essential. Though fall weed problems will be minor, spring and early summer weeds need to be addressed. Start by mulching the soil with straw or other organic materials (well-rotted sawdust, pine needles, and leaf litter have all worked) after planting. This will also help to alleviate frost heaving and cold-damage of any growing tips that emerge before the winter sets-in. In heavier soils, remove or rake back straw once growth resumes in the spring or excess moisture may rot developing bulbs. One to two light soluble fertilizer sidedressings (10-20lbs N/acre) during the early spring (mid-March & early April are best) will promote vigorous and uniform growth. During the growing season, be aware that garlic is susceptible to the same disease and insect problems as onions, such as thrips and various bulb rots. However garlic is relatively care free when given a well-drained site with good air circulation, and kept on a good rotation program with other vegetables. Some growers in the High Country have reported damage from Onion Maggot larvae burrowing into cloves. They also report that satisfactory levels of control have been achieved via a late-April drenching of garlic beds with predatory nematodes from the genus Steinernema. More research needs to be done about this problem and possible solution, but initial anecdotal reports have been promising. Harvest garlic before tops completely die down, preferably with 5-8 green leaves still attached. Pay particular attention to the color of each leaf where it meets the stem – browning there will correspond to decay of that wrapper layer around your bulb. Waiting too long before harvesting your garlic will cause all the paper skins to fall away from the bulb, exposing it to soil, insects, and plant pathogens. Remove excess soil from the outer paper skin, but do not wash your garlic bulbs. Lay whole plants on screens or hang to dry. Common clothespins can be used to hang garlic from a line between barn rafters or a similar space. Allow it to cure completely in a warm well-ventilated room. Watch for rotting bulbs, remove these and increase air circulation if needed. Curing will take about 4-6 weeks. At that time roots and tops can be trimmed, and outer dirty skins can be removed. Store cured garlic in a cool (50-70 degrees F.) and dry (50%-70% humidity) place. Garlic varieties generally taste the same at harvest time, but after curing and some storage time, individual variety flavors will come out, with flavors becoming stronger over time. Garlic can be broken down into two basic groups, softneck and hardneck (top set) types. Most of the 250 million pounds grown annually in this country are softneck cultivars, with California leading production of this type. Softneck cultivars prefer milder climates, tend to more irregular individual clove sizes, and lack the strong flavors of hardneck types. They do not produce a seed scape (flower stalk) during the bulbing period. Hardneck types of garlic all do ‘bolt,’ or produce a scape, about a month before maturity. The young scapes of hardneck garlic can be harvested in late May to early June (after they begin to curve over but before they get woody) and eaten or sold as an early garlic harvest. Garlic scapes are particularly delicious when brushed with olive oil and then grilled until slightly blackened and tender. Failing to harvest the scapes of most hardneck types will result in bulb size being compromised. One source stated that for each week a scape is left on the plant after it curls into a circle, final bulb size will be reduced by 5%. Hardneck garlics, also known as ‘ophio’ garlics due to their being classified into the subspecies Allium sativum ophioscorodon, can be further broken down into ‘rocambole’ and ‘continental’ types. The cloves of rocamboles alternate between fatter and thinner widths around the central flower stalk. Due to their loose skins, they are easy to peel but will not store for very long – generally under six months. Rocamboles’ flavor is generally considered to be the most distinctive and pungent. Continental cloves, such as from Music or Extra-Hardy Porcelain, are equally wide all around the central flower stalk. Their tight skins allow for longer storage (up to 11 months after digging), but their flavor is somewhat milder compared to the rocamboles. There are hundreds of named varieties of garlic, but considerable debate about which varieties are truly distinct. A quick search on the web will reveal several companies that specialize in mail order seed garlic, and which offer a wide (and sometimes confusing) selection. Interestingly, garlic adapts to various sites and many different strains have been developed, each with claims of unique characteristics. Thus performance can be very site specific, and with selection over time, a grower may be able to encourage area adaptivity of a specific strain. Many Western NC growers sell high-quality seed garlic. Contact Extension for a current list of local garlic producers, or search ASAP’s local food guide. In general most small-scale growers produce hardneck types. Reports from growers in the region indicate that the varieties "Music" (or "Musik") and Porcelain Extra Hardy, both Continental hard neck types, have performed reliably and consistently. For a range of garlic strains/types to try, some worth experimenting with may include “Purple Stripe,” "Spanish Roja" and "Carpathian", (all rocambole types); also "Inchelium Red" "Idaho Silverskin" and "Persian Star", which are artichoke, silverskin and purple stripe types respectively. Keep in mind that these recommendations are based mostly on grower feedback, and not yet controlled university trials.